This request is to raise funds to buy over 1000 DESKITs for underprivileged children in schools run by 2 NGOs. According to 2016 ASER report, only 47.8% per cent Class V students of rural India were found able to read a Class II textbook. This meant every second Class V student in rural India could not read the text of a class three levels below. One of the reasons may be because of lack of basic infrastructure in their schools or at home. Students from the underprivileged sections of the society suffer due to the lack of basic infrastructure like tables. Imagine, how difficult it is to read and write in hunched-back position for long hours. It is not only demotivating but also leads to health problems and bad handwriting. Many students don’t have school bags to carry their books neatly to school, they use polythene bags. Their books are tattered and torn. PROSOC Innovators Pvt. Ltd. [www.prosoc.co.in] incubated at IIT Kanpur in SIDBI Innovation and Incubation Centre and UnLtd Delhi came up with a bright idea. 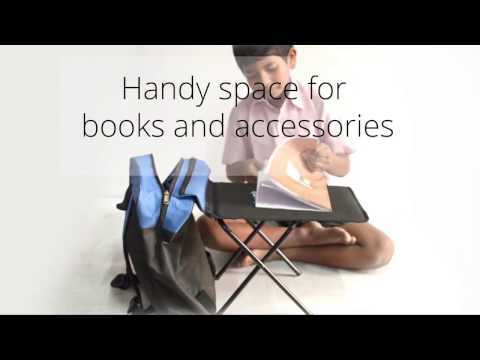 It has designed and developed DESKIT – a unique combo of a lightweight portable school bag and an ergonomic detachable table - that actually works wonders. DESKIT is a study companion for school children to be used in both school and home or anywhere else. DESKIT is patented and Design Registration number is 287945. Thus, DESKIT is a small step towards eliminating such hurdles to help children learn and grow with proper facilities. The selling price of one DESKIT is INR 500/- . But the problem is affordability, parents of weaker sections cannot afford. So, we need to opt for other fundraising possibilities such as establishing collaborations with NGOs and philanthropists for becoming facilitators, we request CSR initiatives of companies to buy DESKIT for needy students and invite sponsorship from commercial organizations. This fundraising campaign is another approach to ensure that a deserving child gets DESKIT free of cost. Sarthak focuses on providing education and improving the quality of life of children who are deprived of it due to financial and situational constraints. The goal is to reach out to slum children, beggars, rag pickers and children engaged in any form of labour. It is heart wrenching to see young children picking up rags from filthy trash to feed themselves, being made to work days and night to make their ends meet. What started in 2013 with six to eight children from slums, grew in three and a half years to teaching more than 500 children in an Open Study Centre model. Currently, Sarthak runs five centres in the state of Uttar Pradesh. The Open Study Centre provides quality education absolutely free of cost at the heart of the slums. The classes are run post school hours six days a week. Due to the location of the centre, it is easier to ensure regular attendance and participation of the children. The children are taught English, Mathematics, General Awareness and Etiquette. Also sports, arts and cultural classes are conducted on weekends. Sarthak does counsel them regularly and take care of their everyday issues (clothing/health/psychological). EFRAH is committed to work for the holistic development of the people, living in dehumanized and deprived conditions in the society. One of the objectives of the organization is to promote and provide quality education to children who are socially & economically deprived. Delhi is the city where each year millions of people move from rural hinterland towards city in hope of livelihood. The people who end up in slums and streets are migrants from adjoining states and also from states where incidence of poverty is intense. As migrant parents struggle to win daily bread these children end up as rag pickers, exploited as cheap laborers, fall victim to dangerous social vices among other inhuman consequences. Subjected to competing negative reinforcements and exploitative forces these children are in general relegated to bleak future. EFRAH started with 150 children of vegetable vendors in Okhla vegetable market area, New Delhi with an aim to mitigate child labour and mainstream those children with school for the sake of availing regular education. Those 150 children were engaged as child labour along with their parents in vegetable market. At present, EFRAH is working in Madanpur Khadar J.J. Colony, Ali Vihar, Okhla, Sangam Vihar, Tughlakabad Extension, Saheen Bagh, Batla House, MCD schools of West Zone and Uttar Pradesh (Noida, Auraiyah & Etawah district). EFRAH is functioning through child centered community development approach and advocacy is a part of our each program. We adopted “education and rights” as a tool for social change particularly among informal economy as well as unorganized community. Now there are more than 500 students. 2. Collaboration with more NGOs or companies with CSR activity. 3. Advertisement for an innovative product DESKIT from commercial establishments. 1. A good facility to read and write for deprived children. 3. Study accessories to improve their academic performance. 4. Help NGOs who really do humanitarian job in reaching out to deprived children. 5. A social start-up to grow and impact lives of many more people. For donations above Rs. 5000 a certificate of appreciation designed specially by design professionals. A thank you card with names of all the DESKIT recipients of your donation. What if the parents are not economically sound enough to support kid’s education? It is our social responsibility to encourage children by providing better facilities. So come and join these young innovators at Prosoc in fulfilling their dream of redefining education in our country. Even the smallest contribution, that teeny weeny bit of share on FB, that single word about them on Twitter or linkedin- could make a world for difference and bring Prosoc one- step closer to realizing their vision of a nation of smiling, happy upright kids. Studying is a joy – Help underprivileged students to experience this joy through DESKIT - an innovative student companion to supplement infrastructure. Your share could be as good as a donation for PROSOC Innovators - SEC! Not everyone can afford to take care of their loved ones. PROSOC Innovators - SEC's life can only be saved by donations made by kind people like you.